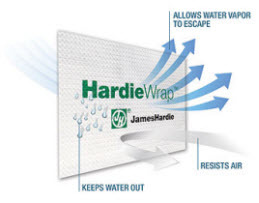 Exposures Available: 4", 5", 6", 7", 8"
HardieWrap™ Seam Tape is designed to seal vertical and horizontal seams and small holes in the weather barrier to prevent air and water infiltration. 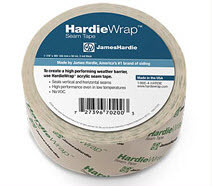 HardieWrap Seam Tape adheres to most surfaces and continues to perform even in low temperatures. It contains no asphalts, VOCs (volatile organic compounds) or solvents, which can reduce adhesion over time.